Second Wind Publishing is Celebrating Three New Releases With a Book Giveaway! The three new releases are: Scorpion Bay by Michael Murphy, She Had to Know by Coco Ihle, and Dear Emily by Louise Thompson. A high tech motorcycle, a black disguise, a crusading newscaster’s quest for justice.When a car bomb kills the prosecuting attorney and a key witness against a powerful bioengineering industrialist, the blast shatters the life of the attorney’s husband, popular Phoenix television investigative reporter, Parker Knight. After authorities hit a dead end, Parker risks his career and his life to seek his own revenge. Riding a high tech motorcycle and wearing a black disguise, the crusading newsman inadvertently becomes a media created superhero jeopardizing his quest for justice. How could a fine institution, born in Europe and perfected in America, disappear in little more than 100 years? For even more fun, click on the covers and you will find a delightful surprise! For several weeks, I’ve been rewriting the second draft of my fourth Casey Holland novel. Second drafts have always been daunting for me because they inevitably involve adding chapters, or deleting/moving large chunks of text. Getting rid of superfluous characters and fleshing out the important ones are also part of the process, never mind chiseling out tightly written, grammatical correct paragraphs. I tend to write the first draft straight through chronologically, and do a fair bit of editing on the opening chapters. When the book is finished, I put it away for two to four weeks, then read the whole thing straight through. By the end of that process, I have five to six full pages of notes about making changes. With this book, I found that I reached the climatic confrontation with the killer far too quickly and am now writing new chapters. Rewriting this second draft isn’t happening in a chronological order. I’m actually working on three different places in the book. Each chapter is being critiqued by my writers’ group every couple of weeks, while I move ahead with penciled changes. Once the penciled changes are made I type them up. During the typing process, I also start more penciled changes in subsequent chapters. Due to deadlines, I soon won’t have time for chronological critiques, and since the group isn’t critiquing pacing or continuity, it doesn’t really matter which chapter I bring. Despite a reasonably organized system, the book feels like a jumbled mess right now, but then second drafts always do. It’s a painfully slow process, as I can easily spend two hours on just three pages. I’m also editing draft number six in my third Casey book and, let me tell you, the process is much faster. I’m happy with the story, pacing, characters, and so forth, so all I need to do is cut unnecessary words. Happily, I can get through a dozen pages in ninety minutes. I wish I could complete second drafts faster. I know what I’m supposed to do, and I have plenty of tips, articles, and books on editing, but it still takes a huge amount of time. I’m in awe of people who can create a polished book with only two or three drafts. It’s one of those goals I’m still striving for. While the recipe above may seem kind of silly, these ingredients can lead to a bestselling novel. I know because I've used them all successfully. My novels have made bestsellers lists multiple times on Amazon.com and Amazon.ca. Some made multiple lists on each in a single day. I've also sold over 5000 copies of Whale Song, which in Canada makes it a national bestseller. So how did I do it? I created an exciting day-long event―a "Bestseller Day"―that had enough goodies to draw people in. It was held on my 44th birthday and I gave away 44 prizes. 2.) Get others to donate them. 3.) Find someone to sponsor the event or the prizes. They pay for something you want to give away and get something in return, whether it's free advertising, a mention in your next book, or some other benefit. The first benefit of reaching this "status" is obvious. You can use "bestselling author" when describing yourself. The next obvious benefit is that you're selling more books, which means you're earning more. Another benefit you may not have thought about is exposure. When people look for a book on Amazon, they'll often search using keywords. If your thriller is in the top 10-20 of books listed under "techno-thriller", for instance, you have a much better chance of being noticed. While on those bestsellers lists, more people will come across your name and your book. The more times people see you and your book online, the better the chance is that they'll buy your book. Becoming a bestselling author takes persistence, creativity and good organization. Follow this recipe for success and you'll rise like a soufflé. Just don't forget that last ingredient―excitement! 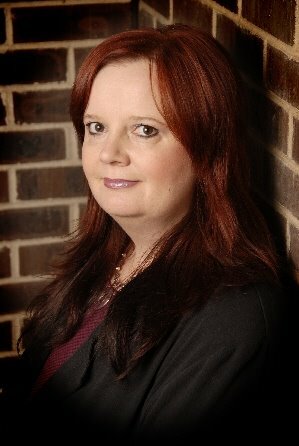 Cheryl Kaye Tardif is a bestselling Canadian author whose critically acclaimed, award-winning novels have inspired much film interest. She's appeared on television and radio, and in newspapers and magazines. Cheryl has also presented at writers' conferences in Canada and the US, mainly on topics of marketing and promotion. She's helped many authors achieve success and does so as a book marketing coach, with Bestseller Days, Virtual Book/Blog Tours and Sponsorships her top 3 most requested topics. Rewriting is Fun! It's FUN! FUN!!! Rewriting is hell. I mean fun. I'm not talking about, "I need to make this sentence active instead of passive," or "This paragraph could be tighter," or "I need to show this scene instead of just telling what happened." I'm talking about the kind of rewriting where you have a finished manuscript, but you realize something has gone terribly wrong. All the material is there, but it isn't put together effectively. It's like, "Yes, Dr. Frankenstein, you gave the monster two eyes, but one is in his armpit and the other one is inside his left nostril." When that happens, you just want to take the manuscript out and dig a hole and bury it and plant roses and keep bees and forget you ever wrote anything. But take heart! You really can rewrite that sucker and live to tell about it. One way to do it is to organize by high-lighter. Read through, and every bit about Annabelle's inheritance gets highlighted in blue. All the bits about Sir Rodney's spaniel get highlighted in yellow. Every reference to Aunt Euphonia's little problem is highlighted in green. You can also copy and paste related bits into bits files: a document just for Annabelle, one for Sir Rodney, one for Aunt Euphonia. Or, if you don't like computers, write the bits or their locations on notecards. If the problem is scene order, print out each scene separately or fill out a notecard on each scene and arrange them, then cut and paste the document into that order. Have a good, concentrated run-through afterwards to make sure the continuity flows. I did this scene shuffle once, and an object kept turning up before it had been acquired, or was missing before it was lost. If you have a friend who is really good at catching inconsistencies, try to persuade that friend to read for you. Rewriting isn't easy (speaking for myself, anyway), but it's highly satisfactory to have something that doesn't work, take it apart, put it back together another way, and have something that seems seamless and inevitable. And worth all the effort. I just received the most wonderful review of Light Bringer, my speculative fiction thriller. You have to love a review that talks about the author's "broad knowledge and brilliant imagination." The author, in this case, being me. The reviewer, Sandra Shwayder Sanchez from BookPleasures.com, also says: "The plot, replete with secret sinister underground corporate experiments, extraterrestrial creatures, a couple of budding romances, could have been the stuff of trendy comic books or yet another television series but the author’s excellent characterizations make it real, original, the stuff of literary fiction. Stylistically the author is adept at moving between lyrical poetic descriptions of nature, wryly funny dialogue and perfectly paced suspenseful writing." Yep, she's talking about me again. Wow. Yesterday, I attended a well publicized literary festival in one of my local communities. This is an annual event run by an arts council and although the tables were nicely arranged and there were lots of great volunteers, there weren’t many more customers than there were displayers; however, this isn’t an unusual phenomenon at literary events. Unless organizers tie book events into larger events (fairs/festivals, etc. ), or hold these events in high traffic areas, the customers won’t go out of their way to show up. It’s interesting because this morning, I was on a forum where a writer was lamenting that the announcement of his new book—placed on several venues, and to family and friends—generated virtually no response. A couple of others writers commented that they’ve noticed a definite decrease in the amount of support and comments they’ve received on their blogs and for their books. Hmm. So, what’s going on? Well, I can only speak from personal experience. When I started to build an internet presence about three years ago, it was great fun to meet other virtual friends, to “friend” all sorts of people on MySpace, etc., and to chat. A number of people proudly announced their books and asked for tags, votes in contests, reviews, and other forms of support. I tried to comply, but it soon became clear that the number of writers asking for support was multiplying faster than rabbits in spring. Frankly, I was a bit taken aback that strangers were asking me for favors because I would never ask someone to vote for me for anything. Also, my review requests went directly to reviewers, not to forums at large, so to speak. I’ve also never put out a general requests for tags; if I tagged someone’s book, I didn’t ask to be tagged back, although I’m starting to now because tagging takes time. To this day, though, I don’t expect anything back from anyone. I make announcements, try to keep people informed about what I’m doing, and let it go at that. Some might call me a poor marketer, and maybe I am, but I have to do what feels right for me. The thing is, I’ve drastically cut the number of votes I cast, tags I give, and comments of support because I’m overwhelmed by the sheer numbers of people asking. It’s like an electronic tsunami that threatens to drown me if I don’t pull back and limit by internet time. Much of the week, I have to skim the many forum posts I receive daily, and I’ve already left a few groups. The bottom line is that we all do what we can, but there are so many writers and so many requests that it’s becoming more difficult to offer the level of support that colleagues wish for. It’s like yesterday’s literary event: too many sellers, not enough buyers, and a little less support every year, for plenty of good reasons. But you know, hasn’t it always been this way, to some degree, for writers? I’ve written about the battle of e-book pricing between Amazon and major publishers before. I’ve also written about the growing rate of e-book piracy, and the significant decrease in print sales, but this week I read about a new conflict: the looming battle between publishers and libraries. A recent article by Mary Ann Gwinn of The Seattle Times, stated that HarperCollins recently decided to limit the number of times their e-books can be borrowed before the library has to pay for the right to circulate the e-book again. The number they decided on was 26. Hmm. Out walking the other day, I noticed an incredible shadow of a tree on the sidewalk, and I had to stop and take a picture. I happened to pass at just the right time. In a few minutes, the sun would be in a different position, clouds would filter the sunlight, and the lines of the shadow would blur. But for just a moment, there it was -- stark and beautiful. Since I happened to be carrying my camera, I am not the only one who saw that shadow -- you can see it, too. 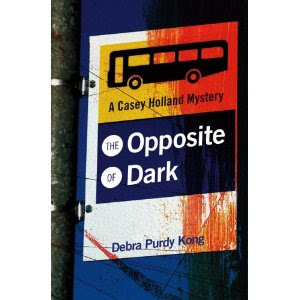 My debut Casey Holland mystery, The Opposite of Dark, has officially been out for about three weeks and, as every writer knows, it’s up to us to do our own marketing. My publisher officially launched their spring season on the first of March and have been busy lining up events for their writers, which must be a daunting task for the publicist. To help the cause, I’ve compiled a list of events I’ll be participating in. As I mentioned last week, I and Kay Stewart will be launching our debut mysteries, The Opposite of Dark and Sitting Lady Sutra at The Fort Cafe, 742 Fort Street, Victoria on April 12th at 7 p.m. I’m delighted to announce that we will now be joined by mystery writer Roy Innes, who will be reading from his third mystery, Murder in the Chilcotin. There will be reading, conversation, and mystery writing secrets revealed! Kay and I will do this again in Vancouver on April 27th at 7 p.m. at the People's Coop Bookstore, 1391 Commercial Drive. Apparently, they have a brand new space for such events, and since my main character, Casey, lives in that area, I‘ll feel right at home. The next night, at 7 p.m. on April 28th, I’ll be on a panel in the Alma VanDusen Room at the Vancouver Public Library, 350 West Georgia Street, for Coastal Crime Wave: An Evening at the Arthurs with BC Crime Writers. Not only will be having a lively discussion about crime writing, but we will also be announcing this year’s finalists for the coveted Arthur Ellis Awards. It will be a great night!